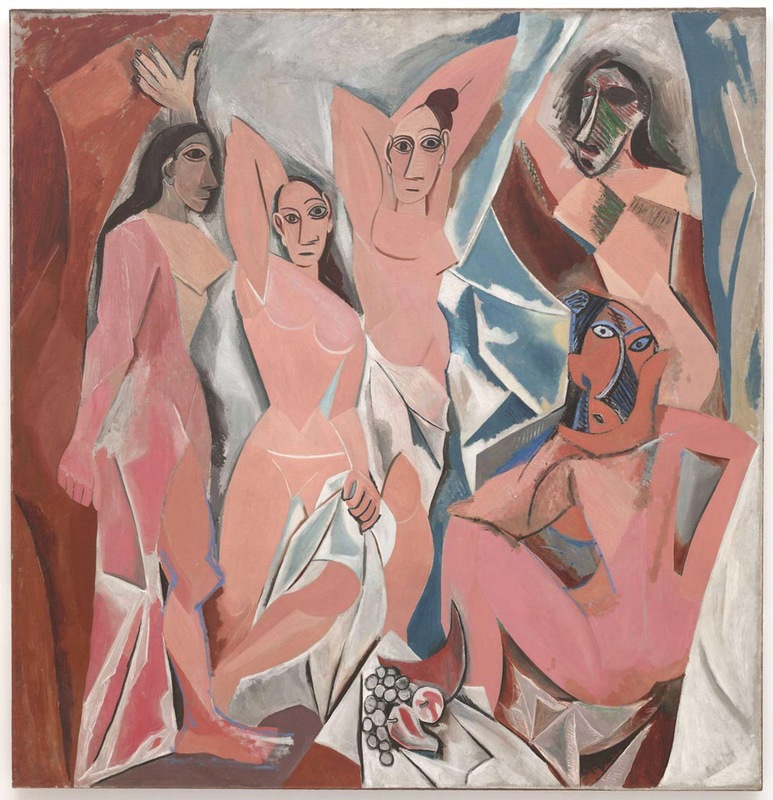 Les Demoiselles d’Avignon: disturbing, shocking…mesmerizing! | Jorge Sette "Linguagem"
Les Demoiselles d’Avignon: disturbing, shocking…mesmerizing! Considered by many the quintessential painting of the 20th century, the first radical rupture with the aesthetics of the 19th century and all the previous western art in general, this iconic painting still has the power to mesmerize, disturb and even shock visitors to the MOMA in New York, where it’s been housed since the late 1930s. The influences this enigmatic painting incorporate range from Iberian art, African masks, photographs of African tribes, and, mainly, the sheer raw inspiration of Picasso’s wild imagination, who probably projected a mixture of images, feelings and contradictions fished from the depths of his psyche onto the canvas. Access to the artist’s notebooks and sketches after his death in 1973 has shown that Picasso underwent serious preparation for this work. There are 700 sketches of what would become The Demoiselles before it finally came to light. Such painstaking preparation seems to be a unique feat in the history of western art. No other known artist has ever gone to such lengths to prepare for a piece. Supposedly representing prostitutes in a brothel, the painting goes way beyond this interpretation, defying the concept of narrative or even of interpretation itself. It could be a deconstruction of many previous nudes in western art, taken apart and rebuilt in a total original and contemporary way. Rumor has it that Fernande Olivier, Picasso’s mistress of the time, could be the inspiration behind the faces of all of the women in the painting. Her response to the piece, when she first saw it, was a disconcerting silence, which can only me interpreted as profound disgust and hatred. Fernande’s reaction was not very different from anyone else’s at the time it was painted – 1907. The work was kept hidden in Picasso’s studio for years and was only seen occasionally by his friends and critics. Despite the fact that Les Demoiselles had partially been inspired by Matisse’s revolutionary The Joy of Life, his reaction was very negative. He thought Les Demoiselles was a mockery of all they were trying to accomplish in terms of Modern Art at the beginning of the century. And he threatened to get back at Picasso for his insult. The work was only exhibited publicly 9 years after its creation: Picasso himself needed all this time to sum up the courage and strength to face the bombardment of criticism he knew it would generate. Even viewers today sometimes complain of the aggressiveness of the work, whose characters seem to stare down at them with weird unpaired eyes in an attitude of contempt and superiority. Despite all the controversy, however, the fact is most of us have grown accustomed to Picasso’s style – or rather styles – over the years, and the painting is the jewel of the MOMA, loved and treasured by most visitors. This entry was tagged cubism, Les demoiselles d'Avignon, matisse, modern art, pablo picasso, picasso, teaching english. Bookmark the permalink.